Quite a few real food bloggers I follow have posted about their menu plans. Most people seem to find that a set schedule of what food to buy and what meals to make is less stressful. I saw a few example posts about how people have done menu-planning with their lists of food to buy, the meals to prepare and when, even including detail like when to take something out of the freezer. The menu-planning itself seemed to require some planning. Most used a binder or sheet of paper, but some used recipe cards as well. I sat down and tried to think it through and come up with a way to do menu planning. It’s not very easy for me though. I get a vegetable basket each Wednesday delivered to my door, but I don’t know exactly what’s going to be in it. They post ahead of time what the contents will be, but the company is big on getting the best produce to your door so sometimes if a crop is not ready or the order doesn’t come through, they substitute it with another item. So, planning the vegetable dishes wasn’t going to work. I go to farmers markets on the weekends usually for meat and some extra veggies, and tend to pick up what they have in stock at the time. 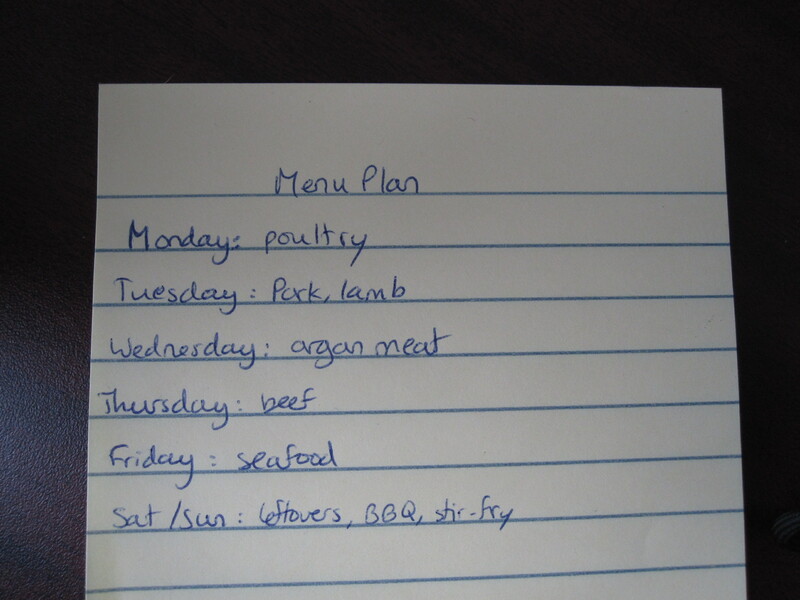 So there’s no one day I can sit down and plan out a week full of meals. Planning the menu-planning was making my head spin. Hong knew I was stressing about coming up with what to cook. Our breakfasts are the same everyday and we’re completely happy with that. Lunch is leftover dinners. But coming up with what to cook for dinner was always tough. I do just fine if he suggests a meal he wants, but often we’re both busy and forget. I’m always running out the door to work when I realize nothing has been planned for dinner. This isn’t easy to work with when most of the meat is frozen (in butcher paper) and I might have to pick up ingredients on the way home for whatever I decide to make. For last-minute meals I tended to rely on seafood which cooks quickly, chicken pieces that I can buy in plastic and thaw quickly in hot water, or resort to omelets and bacon as dinner. Hong came up with a great idea that we just have each day of the week be a type of meat and go from there. It has been working out great. I usually decided what meat to take out the night before, to thaw in time. I’ll either do a slow cooker meal, stir-fry or bake it after work. It seems vegetables are a lot easier to just throw together and meat was the one part of it that was stressing me out. Once you know what meat you’re going to cook, the rest falls in place. And one thing I have learned from Chinese cuisine: any vegetable can stir-fried with just oil and garlic. Lettuce, cucumber, cherry tomatoes, carrots, any leafy greens, can all be stir-fried and taste delicious. We originally were going to start with this type of plan and then if needed move to more of a traditional full menu-plan but so far we haven’t needed to. We left it flexible. If I thought of something I really wanted to make the next night but it didn’t fall on the proper day, I would make it anyway and just switch the days. I try to make soup once a week but count that as extra, not a full meal. Once a month I’ll take stock of the freezer and decide if it’s time to order more meat from local farmers. Wednesday I have my vegetable and fruit basket delivered. I’m lucky that in Ottawa everything is pretty close and we have a car. It’s not hard for me to stop at the store on the way home or get to the farmers markets on weekends. Maybe someday I’ll do full out menu planning, but for now this seems to be working quite well. I’d love to hear how you plan out shopping and/or cooking. Do you plan out meals? Only dinners? And what about snacks, lunches, breakfasts…? Emil and I only plan dinners and we do what you do, every friday we figure out what meat we want for the week and thenthe day before I go through some recipes and figure out what we have and if I need to stop at the grocery store on the way home. This summer I’ve been relying on the farmers market more for meat and veggies then the grocery store but some weeks it’s not possible like this weekend we will be away. For lunch I take left overs if there are some if not then I do a batch cooking a couple times a month and have food in containers in the freezer that I can thaw out and reheat for lunch. Emil usually has the same thing every day for lunch, sandwhichs and some times left overs if he has no lunch meat. For breakfast I alternate between english muffin and peanut butter or english muffin and egg. If it’s my day off i go a little more fancy I do a full brunch with omellettes etc. And snacks always consist of veggies or fruit and what ever is in season. I understand what you mean by your sugar addiction since in the summer I eat more fruit then the winter with all the berries and cherries. And i realized the other day I’ve been grabing those to eat more and my vegetabes were always eaten only at dinner or lunch with a meal not as a snack. I suggest you try canning your stuff this fall to have some inseason stuff available for the winter and then it will make it easier to plan. 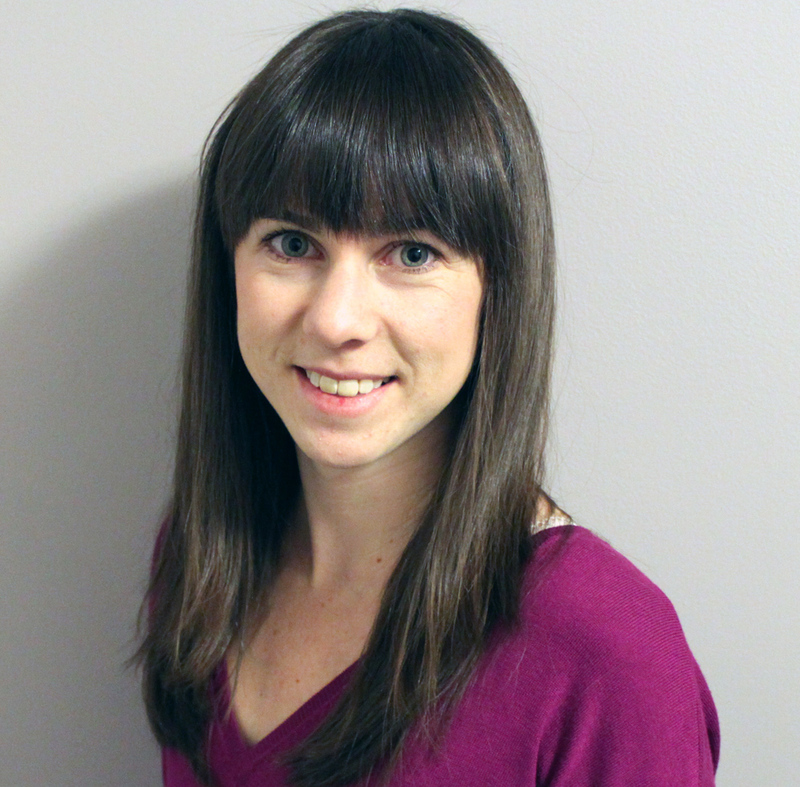 Hey Kat: Thank you so much for your blogs. I just found them and love them so much-very good ideas and tips you have. In regards to the menu planning, I pretty much do the same thing regarding breakfast and with lunch always have leftovers with salad and dressing. As for dinners, every Sunday night I sit down my my Shoprite circular and make my week’s menu from there. Monday morning I go food shopping for most things then Tuesdays go to Whole Foods for the rest. Planning is key on SCD, without a doubt! 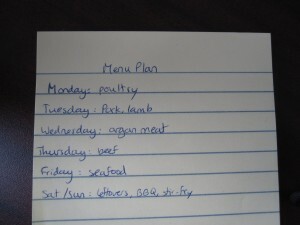 I need to be organized about my meal planning otherwise it simply doesn’t work! I keep all of my recipes online, and each Friday evening I go through my “recipe book” and decide which ones I’m going to cook for the coming week. I then make my shopping list accordingly, then hit the Farmers market and Whole Foods on Saturday morning. Each evening before I go to bed, I decide which of those recipes I’m going to cook the next day, and pull the meat out of the freezer and into the fridge to defrost. It can be a bit of a drag deciding all meals in one go (well I choose about 5 and let 2 float till later in the week), but having a list of all my recipes helps – oh yes, haven’t had that for a while so we’ll have it this week…etc. On another note, I tried doing GAPS last year for digestive issues but the only way I can is to cheat slightly with small amounts of white rice and sweet potato. The main thing I’m avoiding is gluten. But then this year, I completely feel off the wagon and went back to eating bread for a while. I’m now recommitting to a gluten free diet, and have found fresh inspiration in your blog 🙂 I’m always scouring the web looking for snack and dinner ideas, so please keep posting recipes!! @B-L I do want to try canning this fall, especially with growing tomato plants this year. I want to can tomato paste, puree and chopped tomatoes. Have you done it before? @Theresa Donohue Yep planning of some kind is key. I really do get in a panic if I have nothing to make for dinner. @Debbie Your plan sounds great! I really need to write out all my recipes. That would make it easy to just look through a bunch of recipes cards and see what we can make depending on the produce/meat selection we have that week. Get back onto GAPS! I tried some rice a while ago but no longer have it. Sweet potato on occasion and some chocolate. I really think that staying away from grains is the most important part. That can really throw a wrench in our plans, especially when it comes to seafood. Most parents have the “well, it’s what’s for dinner and you can walk away hungry” speech, or they cook separate meals. In my house, I can do neither. If they don’t get the protein, they crash. BIG TIME. And if we invest a lot of money and energy into making one meal, then I am for sure not making specifics for each family member. I’m exhausted in the kitchen already!!! Remembering to thaw is the BIGGEST challenge we have, and beyond that, having enough time to prepare a meal with 2 children needing attention from me at the same time. The slow cooker saves me quite a bit on nights when I remember that we have a doctor’s appointment, etc. and won’t be here for lots of prep time. @Chickiepea For quickly thawing the meat, throw it in a plastic bag, seal it, and submerge in warm water. Should only take at most 30 minutes to thaw out completely. I do this with meat that is wrapped in butcher paper. If the frozen meat is already vacuum sealed in plastic, just put that in warm water. I can’t imagine the difficulties you face with cooking for your kids. If you have any tips, good sites/reads that have helped you I’d be very interested. I have a young cousin who is a picky eater and my Aunt says it’s been difficult to get her to try anything new.